Boca Raton, FL – On Sunday, April 22, St. David Armenian Apostolic Church hosted parishioners for a special award ceremony and luncheon to honor Archdeacon Nick Potookian for his fervent dedication & outstanding commitment to the service of our Church. Very Reverend Fr. 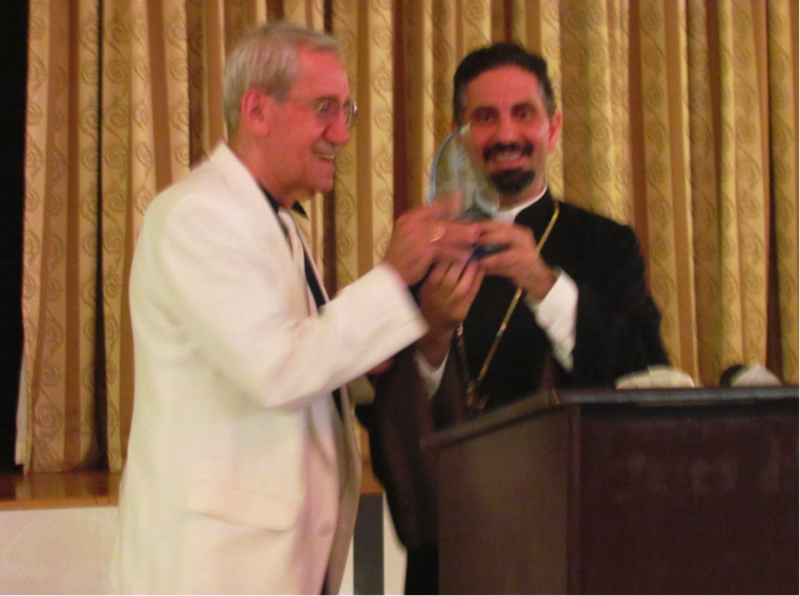 Nareg Berberian, Pastor of St. David Armenian Church, presented the award on behalf of the Parish Council. He expressed his heartfelt gratitude to Potookian for his faithful service on the Holy Altar every Sunday, noting that he was one of the best deacons we have had at St. David during his pastorate. Potookian’s daughter, Doreen A. McCord, spoke very highly of her father, expressing how wonderful he is and always diligently focused on providing for his family since he came to America from Jerusalem where he was born in 1932. After working at the United Nations in New York City, he moved to Florida in 1994 where he started serving in St. David Armenian Church. He was ordained a Deacon by His Eminence Archbishop Khajag Barsamian. Mrs. Anna Damirjian, a long-time close friend, also extolled her praises emphasizing his humility and good nature. Sub-Deacons Brian Adamian and Gregory Merjian gave their testimonies of how Mr. Potookian is so helpful on the altar and makes them feel very comfortable. In addition to serving in the church, Potookian is a past master of a Masonic Lodge, Belleville Lodge No. 108, F. & A.M., in Belleville, New Jersey. While in Florida, he received the Hyram Award, the highest award in Masonic Lodge. He is a past Commander of the Knights of Vartan. He is also the Captain of the Citizens Observer Patrol in the community where he lives. Posted on April 26, 2012, in Armenian Church, Events, General Update, News and tagged Archdeacon, Armenian, Award, Church, Deacon, Honor, Potookian, St. David. Bookmark the permalink. Leave a comment.